Heaney read Docker to the Belfast ‘Group’ led by Philip Hobsbaum in late 1963. He had been invited to join the group as an undergraduate and expose his poems to a small non-denominational assembly of poets. The poem exposes the prejudice lurking behind the dour, uncompromising exterior of a dockworker in mid twentieth centure Belfast. To Heaney’s mind the man’s intimidating appearance embodies the sectarian mentality of favoured Protestant working men compared with the Catholic minority. Heaney is aware of employment policies that discriminated against Catholic dockers: shipbuilders Harland and Wolff for example aimed their recruitment policy towards Protestants. This prophetic poem deals with uncompromising attitudes. Non-communicative, the man sits silent and alone in the corner of a public bar staring at his drink. His face and features reflect the dockside environment in which he works: Cap … like a gantry’s crossbeam/ Cowling plated forehead and sledgehead jaw. His tight-shut mouth (Speech … clamped in the lips’ vice) is indicative of a man who speaks only when he has something to say, who neither challenges his convictions, nor will have them challenged. The docker’s intractable Protestant mind-set emerges (That fist would drop a hammer on a Catholic) affirming the threat of sectarian division long visible in the wider Ulster community. Heaney perceives a wry irony: The only Roman collar he tolerates/ Smiles all round his sleek pint of porter: the dark stout’s creamy head, despite its resemblance to a priest’ dog-collar, is acceptable to a hard-line Protestant drinking-man. Heaney’ reflects on the docker’s mix of narrow but rigid views: Mosaic imperatives like rivets. The man’s unyielding Protestant beliefs and unwavering work patterns fuse: God is a foreman with certain definite views/ Who orders life in shifts of work and leisure; the factory horn that authorizes the end of his working day signals Resurrection. 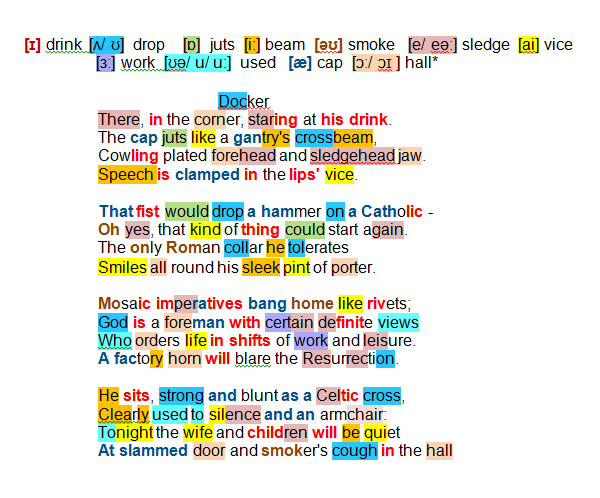 The poet wagers that the docker’s spiritual intransigence (strong and blunt as a Celtic cross) applies to his domestic circumstances; he paints the man’s bullying presence in the home where, fuelled by alcohol, silence and an armchair will be his unchallengeable prerogatives and where, once alerted by the slammed door and smoker’s cough in the hall, his wife and children will (more than a simple future tense, ‘whether they like it or not’) have learnt to be quiet.